Its my Friday lay day and I end this week feeling infinitely better (how would I measure that?) than this time last week. The human capacity is pretty phenomenal. This week the Productivity Commission of Australia released its draft report on how to reform the Australian industrial relations system – Workplace Relations Framework (11.7 mbs). The Productivity Commission grew out of the old Tariff Board (then Industries Assistance Commission) and so administered the trade protection policy of the Federal government in the C20th. As ideological preferences changed, it morphed into its current guise, which is to give advice to government on how to deregulate, privatise, outsource and other trash the conditions of workers. As we awaited this current report, the only interesting question was not what they would recommend but what spurious route and flaky evidence they would call upon to attempt to justify their inevitable embrace of more deregulation and wage cutting in the labour market. As it turned out, the Commission disappointed. They couldn’t even find enough flaky evidence to support their conclusions so in the best traditions of the right wing they just offered up the tripe without any coherent argument and then managed to fit all that into a 1001-page tome. I imagine there is low job satisfaction in that part of government having to come up with this sort of nonsense and pretend you do serious work. I wrote about this topic in April this year – Penalty wage rates are still justified for non-standard hours work. In the blog cited above I go through the reasons why the wage setting tribunals have to date rejected the stupid arguments presented to them by the employer groups. The conservative Australian government is very keen to get rid of penalty rates given it receives a major share of the corporate funding dollar and wants to be helping its rich mates get more of the real income pie rather than less. In the wake of the Productivity Commission report released earlier this week, the Prime Minister (Abbott) has come out in support of the hospitality industry employer groups who want penalty rates cut. The UK Guardian article (August 6, 2015) – Penalty rates: Tony Abbott backs hospitality employers’ push for cuts – discusses this point. I certainly think there are some industries that are doing it very tough because of the changes that the former government made to bring back with a vengeance penalty rates on Sundays and public holidays. The problem is that there is no evidence supporting the view that cutting penalty rates impedes commerce. That was a problem the Productivity Commission clearly came up against in their zeal to make a case for scrapping the extra payments on Sunday and public holidays. I won’t go into a general critique of the Productivity Commission report which spans many topics relating to industrial relations. A reasonable attack appears in today’s UK Guardian article – It’s nonsense to believe more flexibility leads to greater productivity. Suffice to say that as hard as they might try, the Productivity Commission couldn’t really find anything significantly wrong with our industrial relations system, despite the employer groups and the sycophantic economists they wheel out to support them, claiming that Australia was an impoverished, low productivity nation in danger of being left behind by the rest of the world as a result of out overly-generous wages and job protections. The Productivity Commission concluded, for example, in relation to unfair dismissal rules (job protection legislation) that our practices were “unlikely to have significant negative impacts on medium to large businesses, especially considering that their purpose is not to minimise costs to employers, but to balance the interests of both employees and employers”. I was particularly interested in the analysis (so-called) on penalty rates because there are some wage tribunal cases coming up that I am involved in. 3. “There are proven adverse health effects from night shift and rotating shift work”. 4. “public holidays are intended to encourage shared community activities. As such, there are strong grounds for deterrence against their use for working, but with some flexibility to provide some services on these days”. Then they analysed the payment of penalty rates on Sundays which typically attract double the base hourly rate, given the centrality of Sunday in family and social life in Australia. In an unregulated well-operating market, it could be expected that penalty rates would be needed to elicit sufficient labour supply on weekends. But labour markets are not perfect (which is why workplace relations systems exist in the first place). Individual businesses possess some bargaining power in respect of the labour they hire, with the risk that market-set penalty rates would be lower than they should be. Community standards about the reasonable rates for working on weekends in such industries are also relevant. In other words, the employers have too much power and will try to exploit labour, especially when there are high unemployment rates as now. The issue then is what is the correct level? With no further convincing argument presented, the Productivity Commission concluded that “Sunday rates in the hospitality, entertainment, retailing, restaurants and cafes industries should be brought into line with Saturday rates” – which are generally time and a half (over the base rate). Why? Unclear, except apparently we don’t go to church as much as we used to. This is an old furphy. We, however, do a range of other activities on Sundays including family, shopping, homemaintenance, grooming ourselves and family, sport, rest and other things that all preclude working. The Productivity Commission seems to ignore all those activities that are mainstream Sunday time consumers and essential for our on-going health and balance through the rest of the week. In the sectors they think should cut penalty rates, the claim is always that employment is held back as a result of the higher Sunday and Saturday (and public holiday) rates. However, the evidence doesn’t support that. First, the data shows that the Cafe and Restaurant and hospitality sectors have higher growth rates of new enterprises than the rest of industry. 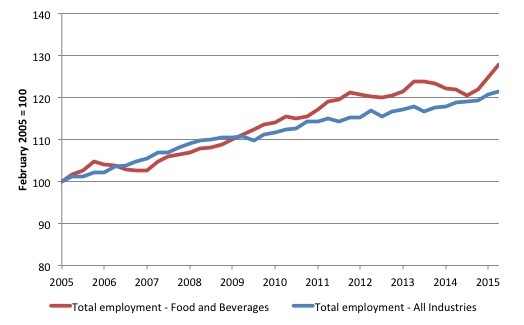 Second, as the following graph shows total employment in the Food and Beverage Services sector (red line) compared to total employment in all industries in Australia since the first-quarter 2005 (indexed to 100) to the second-quarter 2015. It is one of many indicators one can assemble to demonstrate that there doesn’t appear to be a particular disadvantage facing sectors that a heavily exposed to paying penalty rates on weekends and public holidays. 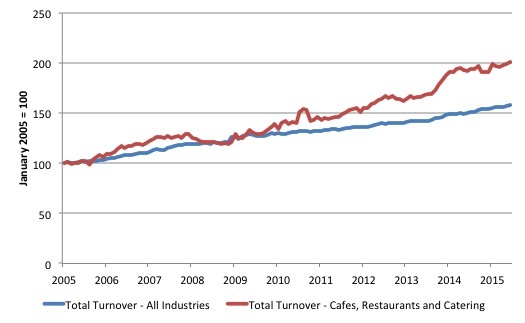 Third, growth in total turnover in the Cafes, Restaurants and Catering Services sector has been much stronger than that of the overall economy despite this penalty rates being concentrated in that sector. In past work, I have examined profitability, business growth, and a range of other indicators and have never found any evidence to support the case for scrapping penalty rates. Given how important they are to low wage workers (more than 1.5 million out of a employed labour force of around 11.8 million), cutting them would likely undermine overall spending in the economy and impoverish tens of thousands of workers who rely on these extra payments for survival. A new ephemeral (irregular) column to record outrage in a measured way. The debate was humiliating. It took place in an empty arena and the moderators, seemed intent on rubbing the participants’ noses in their failure to qualify for the primetime clash. They began by asking, in so many words, why they were such losers that they hadn’t made the cut for the bigger debate. Which sums it up really. But back in 1999, Fiorina was the boss of Hewlett-Packard when she decided to purchase rival Compaq against the wishes of a significant HP shareholding (including the son of the HP founder). The merger was a disaster. By 2003, the ailing company was posting huge losses and she decided to sack 18,000 workers and use foreign labour instead (undercutting conditions). There is no job that is America’s God-given right anymore. We have to compete for jobs as a nation. The company continued to go downhill and a number of the most skilled managers left because they could not longer tolerate her style and ‘success’. There were scandals (allegations of secret trade deals with Iran in contravention of US embargoes) etc and by February 2005 she was done. She walked out with a $US21 million ‘severance’ package. … there is plenty to criticize about Fiorina’s tenure at HP. At this point, the changes that Fiorina made didn’t turn out so well for the thousands of Hewlett Packard and Compaq employees that were laid off and the millions of HP stockholders who lost equity since she took over. HP stock is worth less today than it was in 1999. Dell and IBM stock has increased in value. I guess the changes didn’t work out too well for Ms. Fiorina either. Though based on her $21 million severance package and her generous compensation while employed at HP, I doubt very much that she’s worried about making ends meet. Ideal candidate for the Republicans one would think. This is what I have been listening to while I have been working. This is from the British band – The Cinematic Orchestra – which is a sort of jazz, trip hop, downtempo outfit. It is The Awakening Of A Woman (Burnout) from their 2003 Album Man With a Movie Camera. You just go with this sort of music and let it take over while not appearing to. 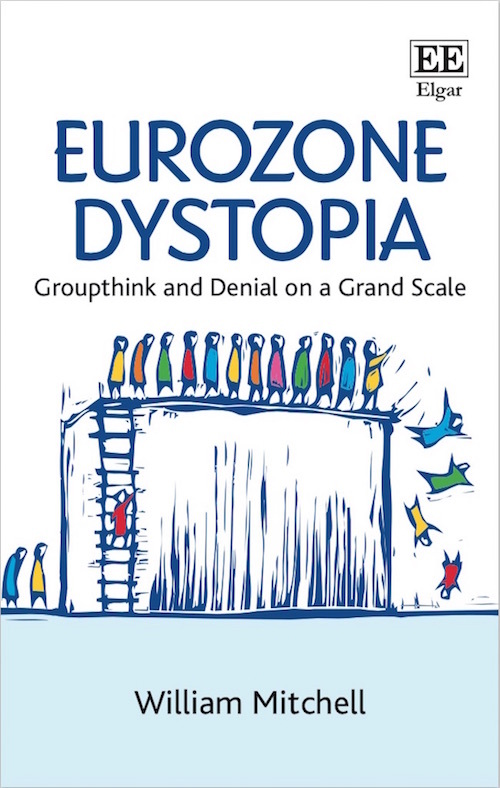 My new book – Eurozone Dystopia – Groupthink and Denial on a Grand Scale – is now published by Edward Elgar UK and available for sale. I am able to offer a Special 35 per cent discount to readers to reduce the price of the Hard Back version of the book. Please go to the – Elgar on-line shop and use the Discount Code VIP35. I find it ridiculous how these employer groups go after worker conditions and penalty rates, while ignoring the “fixed cost” of rents and sky rocketing land prices. Sure it’s fine to go beat up the employees (key asset) for the lunch money you just (justifiably) paid them, but landowners, bankers and the real estate lobby are untouchable. At least those receiving penalty rates are earning their money by producing a good or service, but those landowners (and indirectly mortgage lending banks) simply receive their land rent by virtue of possessing a land title. The hypocrisy never ceases to disgust me. Bunnings pay no penalty rates on Saturdays and time and one half on Sundays.